Chemeon TCP-HF Provides Safe Alternative to Carcinogenic Materials Used on Naval Aircraft. Naval Power Force Magazine featured CHEMEON’s Dr. Sjon Westre and Byron Estes discussing the challenges being faced by our fellow members of Metal Finishing Association of California as a result of ever increasing regulations surrounding the use hex chrome conversion coatings and sodium dichromate seal. The article “Innovative Seal for Anodized Aluminum Eliminates Hexavalent Chrome Emissions.” details the real value, technical support and safety prime contractors and their tier one partners achieve when CHEMEON TCP-HF is specified. Pressure from California air quality districts is mounting as local residents are increasingly voicing concerns over the chemicals exhausted into the air. 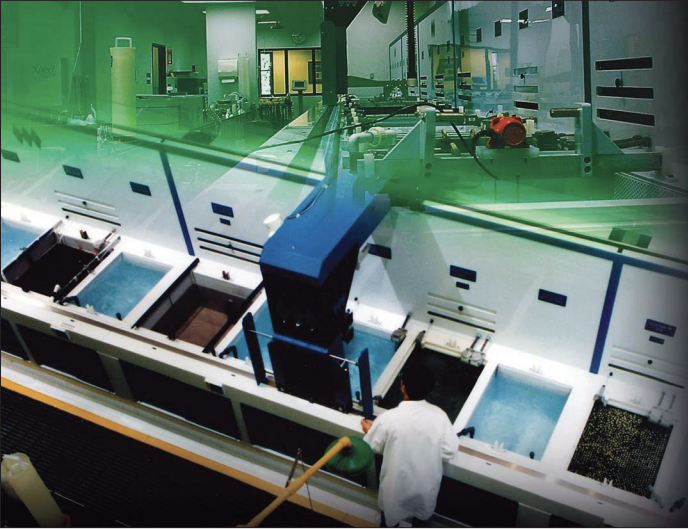 Of particular concern is hexavalent chromium – a known carcinogen and pollutant associated with plating and anodizing processes. Metal Processing Facilities in the area have already employed chemical technologies such as surface tension modifiers (defoamers) to reduce the hexavalent chromium discharge from their chromic acid anodize tanks.1 In other instances, chrome fume scrubbers have been employed at great cost. Although the vapor pressure of chromium is very low, it is believed that the aerosols generated by the wet steam mist above the seal tank and from micro-boiling on the tank heaters are carrying hexavalent chromium into the ventilation and out into the atmosphere. A consortium of local metal finishers, the Metal Finishing Association of Southern California (MFASC), and CHEMEON Surface Technology of Minden, Nevada has been talking and working with SCAQMD and Prime Aerospace Contractors to mitigate the problems. The group has started an outreach campaign to the stakeholders within the aerospace manufacturing sector, explaining the problem and potential downsides to the continued use of hexavalent chromium seals. The outreach consists of direct calls and emails to the engineers who control the processing specifications within the aerospace companies. 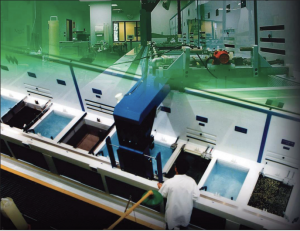 Of course, industrial controls can be used – this is very costly, and will result in some plating shops closing rather than make the large infrastructure investment required. A better choice is to use a seal without hexavalent chromium. Many anodic seal replacements under consideration in recent years are problematic for a variety of reasons and have not been pursued as viable alternatives to dichromates. For instance, the most commonly used seal, nickel acetate, considered a mid-temp seal generally at 160-190ºF, or higher, is energy consuming, and is a regulated pollutant and possible carcinogen. The room temperature nickelfluoride seal is effective as a possible alternative but is a bath where time must be tightly controlled because of the aggressive fluoride content and is a possible causative factor in dissolution of the oxide if the bath is not maintained properly. The high purity DI hot water seal at 205ºF works well but is time consuming, expensive to heat, prone to contamination and must be dumped frequently. Another option is the use of the relatively new sealing technologies afforded by the trivalent chromium compounds originally developed and patented by the United States Navy in the early part of the 21st century.10 CHEMEON Surface Technology was one of the first licensees to bring the product to market – first as CHEMEON TCP-HF and then later derivatives such as TCP-HF SP (Spray) and TCP-NP (No Prep). These trivalent chromium compounds are much safer than their hexavalent counterparts. They have very low toxicity, do not cause chronic exposure problems, and are non-carcinogenic.11 Because the trivalent chromium seal operates at room temperature, there is no aerosol formation from micro-boiling or steam, and very little chemistry is released into the air. The TCP compounds have been available in commercial form since approximately 2006 and have slowly been working their way into Prime aerospace contractor approvals and specifications. Much of the original focus for the trivalents was in the area of replacement for hexavalent chromate conversion coatings on aluminum. In recent years, the original patents that discuss use of the trivalent chromium zirconates as a sealant for anodized aluminum have been reexamined and developed into robust processes and products. In 2010, the United States Navy approved the use of CHEMEON TCP-HF as a post-anodize seal at their Fleet Readiness Center Southeast (FRCSE) in Jacksonville FL for Types I, IC, II, IIB, and III.14 Corrosion resistance, paint adhesion, and fatigue life meet or exceed specification.15 The FRCSE services naval aircraft including the F/A-18 Hornet, F/A-18- Super Hornet, E/A-6B Prowler, and SH-60 Seahawk. The Navy studied the performance of TCP-HF as a sealer and found the performance to be “as good as or better than chromate in corrosion resistance and equal to chromate in paint adhesion. TCP is far superior to water for sealing.“17 Ambient Air Sampler monitors Cr(VI) Hexavalent Chrome Emissions in Southern California. CHEMEON TCP-HF has been shown to produce an anodize seal that is as good or better than conventional sodium dichromate and dilute chrome seals. Sealing with TCP-HF eliminates hexavalent chromium in the air and reduces energy consumption. Discussions are in process with MFASC, SCAQMD, and aerospace Primes about the advantages of TCP-HF. CHEMEON Surface Technology is a Woman Owned Small Business that is licensed by the United States Navy to manufacture the MIL-SPEC and QPL/QPD approved CHEMEON TCP-HF, a replacement for hexavalent chromium. CHEMEON’s current focus is the direct replacement of the hexavalent based sodium dichromate seals with the high performance seal CHEMEON TCP-HF. A special thank you to CHEMEON Research Scientist Jake Cruson for the use of his preliminary data on the performance of Type II anodize with TCP-HF seal. Dr. Sjon Westre Vice President, Technology, CHEMEON – Dr. Westre heads CHEMEON’s development of environmentally responsible coating and seal alternatives to hexavalent chrome for use on light metals and leads the Laboratory, R&D and Tech Center divisions at CHEMEON. 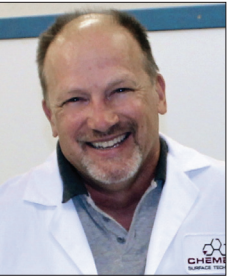 Dr. Westre received his Ph.D. in Physical chemistry from The University of California at Davis and a BS degree in Chemistry with a Physics minor from Cal State, Sacramento. Dr. Westre has published numerous technical papers in the fields of Molecular Physics and Analytical Chemistry. 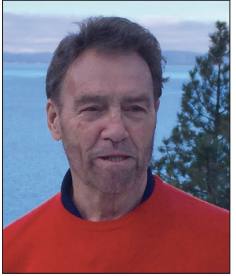 He is credited for the creation of CHEMEON’s training program “Anodizing Best Practices and Troubleshooting.” He also lectured at technical conferences as well as acted as an instructor for undergraduates at UCD. Byron Estes, Vice President Global Solutions for CHEMEON is a hands-on, results-oriented leader driving sales/marketing programs and strategies for Global Suppliers and Domestic/ International Manufacturers and Metal Finishers. His management experience in plant operations, production, inventory control, quality assurance, technical sales and training in the manufacturing and metal finishing jobshop sectors spans five decades. Mr. Estes has taught plant operations including production, quality assurance, tooling and manufacturing sales, and has led the CHEMEON technical courses in Aluminum Anodizing, Trivalent Chromate Conversion and Titanium Anodizing. 16. Alp Manavbasi and Byron Estes, “Advanced Trivalent Chromium Seals for Hard-Coat Anodized Aluminum Alloys”, NACE Corrosion 2010 Conference.